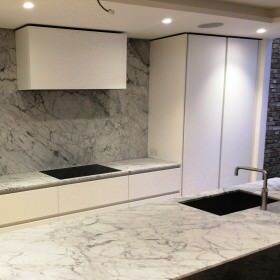 This project involved designing and installing the entire heating and hot water system for a beautiful house in Westbourne Park Road, London W11, that was being completely refitted. We installed under floor heating in the basement and the ground floor and the remaining 3 floors have radiators that are all independently controlled. We also set up the heated towel rails on a separate circuit so they can be on in the summer months without needing the rest of the heating running. The 3 stunning bathrooms are all supplied by a break tank and booster pump set. This allows multiple points to be running without any drop in pressure or flow rate.